The DiMarzio Classic Rock Humbucker Set contains 2 well-designed pickups: the PAF 36th Anniversary standard spaced (neck) and the Super Distortion F-spaced (bridge). Easy to install, they'll bring a collection of classic rock tones to your guitar while reducing noise. Here are the characteristics that make a great vintage humbucker: a soft magnetic field, sweet tone, perfect balance between warmth and clarity, the ability to go from clean to distorted by pick attack alone. For DiMarzio's PAF 36th Anniversary Neck they wanted to continue in the path of pioneers such as Seth Lover (designer of the original Patent Applied For humbucker) and create pickups that combine all of the characteristics of great vintage humbuckers. These pickups are not merely clones. DiMarzio re-engineered the PAF using their patented technology and Larry DiMarzio's own 1959 cherry sunburst Les Paul as the reference. Larry's Les Paul has a uniquely amazing sound and it's not only due to the pickups - it's the total fusion of many elements of the guitar itself. Although the pickups have a weak magnetic field, the sound is well defined - almost like a single-coil. DiMarzio duplicated the weaker magnetic field in order to allow the strings to vibrate longer, as well as focus and articulate the attack and output. They use computer-controlled winders to consistently layer the 42-gauge custom-coated wire, achieving the exact frequency response they want. Then it's dipped in our custom formula to eliminate squeal and microphonics. The cover is made from nickel-silver and new plating makes it more magnetically transparent than the originals. The PAF 36th Anniversary Neck is smooth but not muddy. There is no reference standard for the sound of a humbucker from the 1950s. All of them had variations in output and tone, and these differences could be quite large. Recently, DiMarzio focused their research on making pickups with warm highs and bright lows. This combination is only found in their favorite vintage humbuckers, and it's really good for a pickup intended for both the neck and bridge positions. It allows the bass strings in the neck position to avoid muddiness, and the treble strings in the bridge position to be warm and not brittle. This pickup started a sound revolution. Replacement pickups simply didn't exist before the invention of the Super Distortion in the early Seventies. The Super Distortion (and its original 3-conductor version, the Dual Sound) was the first pickup specifically designed to kick a tube amp into total overdrive, and is still the standard by which all other high-output pickups are measured. The Super Distortion has a perfect blend of power and tone: both single-notes and chords jump out of the amp and fill the room (or the track) with a wall of sound. The balance of tones is classic - thick, boosted mids, big lows and fat highs. This is the sound you've heard for over three decades on platinum records, from players as varied as Ace Frehley, Al Di Meola and Paul Gilbert. It's also versatile: 4-conductor wiring allows instant access to Strat-like split and series-parallel modes. Discover what thousands of great players know: the Super Distortion is the best all-round high-power pickup ever made. 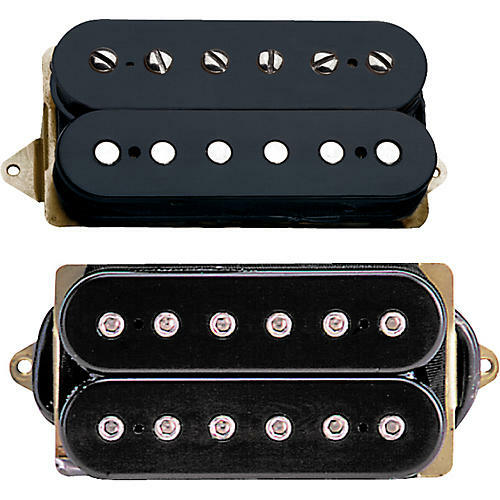 When DiMarzio first built the Super Distortion, it was a one-conductor pickup. As a 4-conductor pickup, it's extremely versatile. Coil-splitting produces a very Strat-like option, both in tone and power. Parallel wiring is similar to splitting, but it's still humbucking and a little more hollow-sounding; Paul Gilbert used to use two Super Distortions wired in parallel when he was in Racer X.